LinkedIn is extending its offering to wearable devices today with the launch of its Pulse app for the Apple Watch. The expectation is that users can be kept abreast of the latest news just by glancing at their wrist. This is LinkedIn’s first foray into wearable devices. “Bringing [LinkedIn] Pulse to Apple Watch allows users to quickly know what’s going on without taking their phone out of their pocket,” said Doug Guastaferro, the lead mobile application developer for this project. The experience was completely redesigned for a more professional feel and alerted users when a LinkedIn connection had been mentioned in an article. No longer just about following what your connections have posted, the app now wants you to follow topics and channels. Provide a quick summary of what’s going on with a look at the top 10 headlines. Offer quick summary of articles, with the option of opening up the Pulse app on your smartphone to get more details. Notify you with information about breaking news and a summary of daily and world events, and contact you if a connection has been mentioned (most likely powered by LinkedIn’s acquisition of Newsle). Allow you to save articles that are shown on the Watch for later viewing on your mobile device. Surface what LinkedIn Pulse determines to be most important articles with a “glimpse” feature. 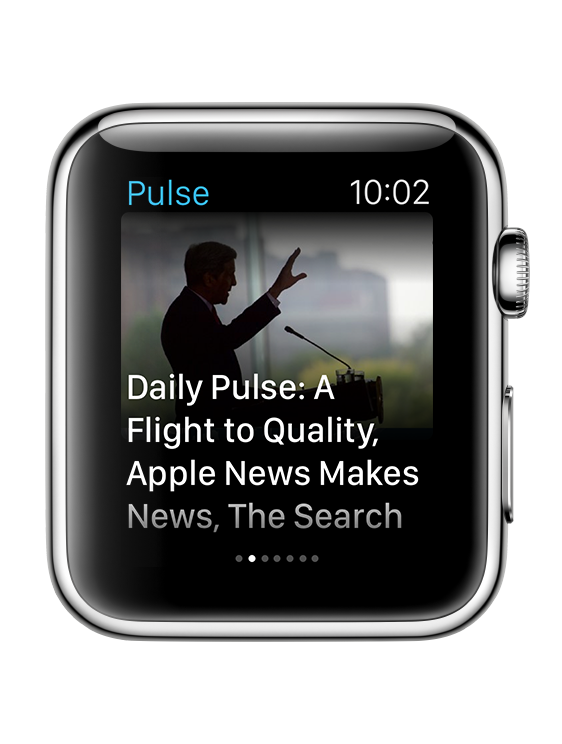 LinkedIn Pulse for Apple Watch was built for watchOS 2, which was released in September.